Just east of Palm Springs and the jutting San Jacinto Mountains, lies the Coachella Valley. Known to many as the home of a large music festival, it is also the largest date producing region outside of the Middle East. Two winters ago, we visited the valley and stopped at Shields Date Garden, in Indio, CA, whose small store is as much a paean to the date as it is a retail outlet. At Shields we tasted nearly a dozen date varietals, most of which are difficult—if not impossible—to find in grocery stores outside the valley. Because a trip to Indio is impractical on an average Saturday morning, I was thrilled to discover Siegfried Dates at the farmers’ market. 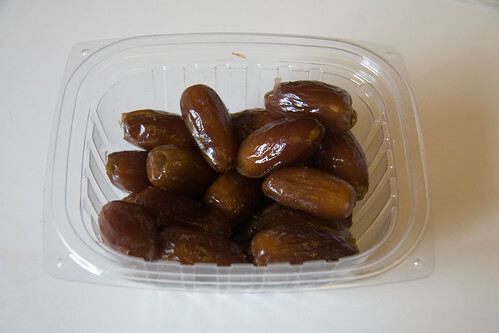 They offer many date varietals from Coachella growers, including some delicious Deglet Noors from Leja Farms. Deglet Noors are a fairly robust date varietal, recommended for cooking. 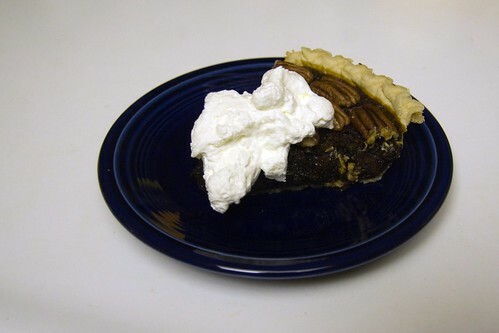 While we were selecting out dates, another purchaser mentioned she was going to use her Deglet Noors in a pork dish, and leaving the market, we initially had similar ideas; however, when I realized that Monday was Pi Day, my thoughts turned to baking a date-pecan pie. 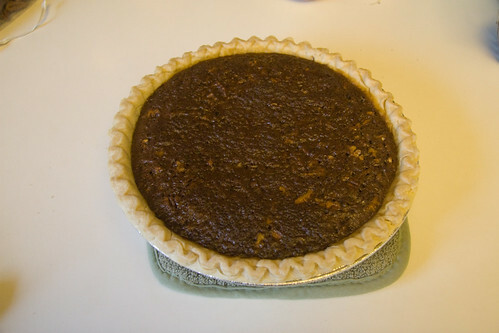 Based on a quick Google search, there seems to be a canonical date-pecan pie recipe, sourced of all places from Cooking Light. I am a bit skeptical about the “light” claims for this pie, but my wife assures me that the recipe is “light for a pie.” As I am far more versed in eating pies than baking them, I am trusting her on this point, but I would consult your a nutritionist or physician before making this, if calories and fat are a mortal concern. Using a pretty good store bought pie crust (again, I am not a baker) makes this recipe ridiculously easy. 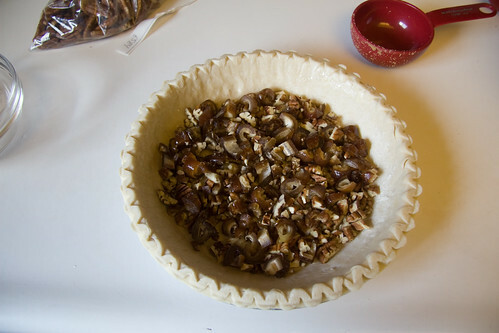 I chopped the dates and pecans (Pawnee pecans from Chico, CA), then sprinkled them evenly on the bottom of the pie crust. For the rest of the filling, I mixed brown sugar, molasses (which I used to replaced the dark corn syrup the recipe calls for), eggs, a little flour and a touch of vanilla and salt. 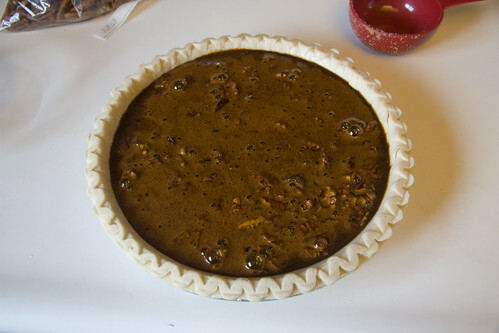 When poured into the pie crust, this lifted the date and pecan pieces, suspending them in a rich, dark mixture of fat and sugar. 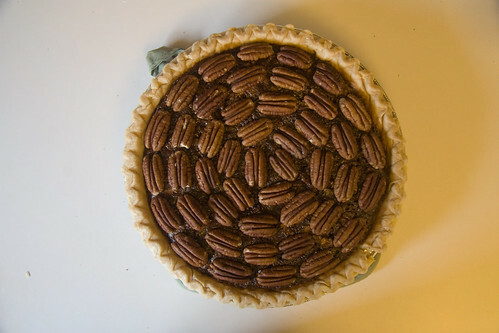 I baked the pie for 45 minutes, then removed it and added a layer of whole pecans to the top. It needed about 15 more minutes in the oven to finish. I think the pie came out looking pretty sharp. We served the finished pie with a healthy dollop of unsweetened whipped cream. 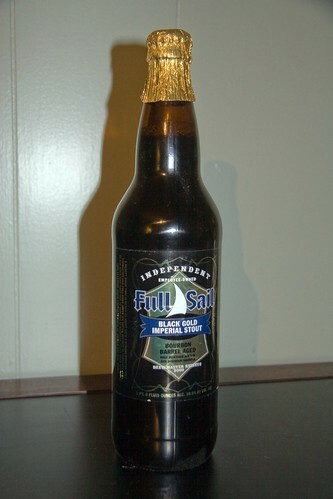 To complement it, we opened a cellared bottle of Full Sail Brewing’s 2009’s Black Gold Imperial Stout, a delicious, bourbon barrel aged imperial stout from one of Oregon’s premiere breweries. This is an awesome pie recipe, and I consider this a first run with it. I found the cup and a half of molasses to be a bit too strong, and in the future I plan to try a half cup of molasses and a 1/2 cup of bourbon brown sugar simple syrup (1/2 cup brown sugar dissolved in 1/4 cup bourbon). I also have a strong desire to add a little chopped bacon to the filling. The pork-date alliance is too strong to resist. The pie making is documented in full here.